The New Orleans Museum of Art has announced the acquisition of a large-scale sculpture designed by international pop art star Roy Lichtenstein. 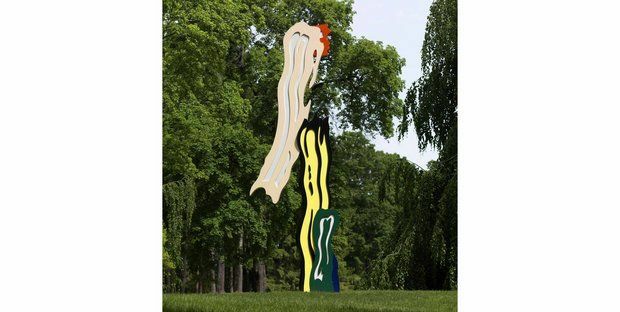 The 20-foot-tall aluminum sculpture titled “Five Brushstrokes” was purchased by art benefactors Sydney and Walda Besthoff, with help from the Roy Lichtenstein Foundation. It will be placed in the center of the traffic circle in front of the museum, replacing a kinetic sculpture by New Orleans artist Lin Emery. Though the NOMA management postponed the announcement until Monday, Oct. 14, the installation of the sculpture has been in the works for weeks. “Five Brushstrokes” is expected to be in place by the end of 2013. Emery’s sculpture was moved into The Sydney and Walda Besthoff Sculpture Garden adjacent to the museum. Lichtenstein died in 1997, but the NOMA sculpture wasn’t fabricated until 2010. The estates of sculptors of sufficient stature occasionally authorize editions of their work to be executed after the artist’s death. Roy Lichtenstein, who was born in 1923, made his mark on art history in the rock ‘n’ roll era. At the time, highly emotional paintings by abstractionists such as Jackson Pollock and Willem de Kooning were the rage. Lichtenstein’s approach couldn’t have been more different. He imitated the lowbrow illustrations in comic books with a meticulous, passionless painting style. The impersonal, melodramatic comic book cells that he reproduced seemed to mock the earnest emotionalism of the self-involved abstract painters that came before him. To put an even finer point on his dryly humorous commentary, Lichtenstein created deadpan close-up paintings of drippy action-packed brush strokes – just the sort of fevered brush strokes that Pollock and De Koonig had made famous. Lichtenstein re-imagined some of those satirical brush strokes in three dimensions – “Five Brushstrokes” is an example. It’s interesting to consider that Lichtenstein’s somewhat subversive sculpture will now be the symbol that greets New Orleans museum visitors. What does “Five Brushstrokes,” made in 1984, “say” in 2013? (via nola.com). View our Lichtenstein collection here.